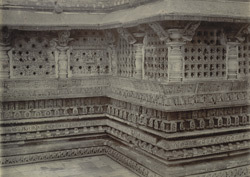 This photograph of the Chennakesava temple, Belur taken in the 1890s by an unknown photographer, is from the Curzon Collection's 'Souvenir of Mysore Album'.The temple dedicated to the deity Chennakesava was built during the early Hoysala period about 1117 and is one of the masterpieces of that time. The temple is entirely built of grey-green chlorite and consists of a sanctuary with minor shrines on three sides and a columned mandapa, raised on a platform. The sculptural wealth of this temple is extraordinary and represents architectural elements and figural carvings depicting different aspects of Vishnu. This view shows the perforated stone screens of the external walls, called jali, which imitate the lattice work and were added fifty years after the the erection of the building.